Leprechaun. 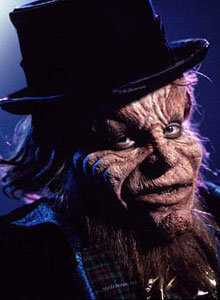 Our favori killer leprechaun who'd do anything to get his or back! :D. Wallpaper and background images in the films d’horreur club tagged: horror films horror movies stills slashers leprechaun promos. This films d’horreur photo might contain fedora, chapeau de feutre, homburg, stetson, trilby, hombourg, and chapeau de feutre trilby.